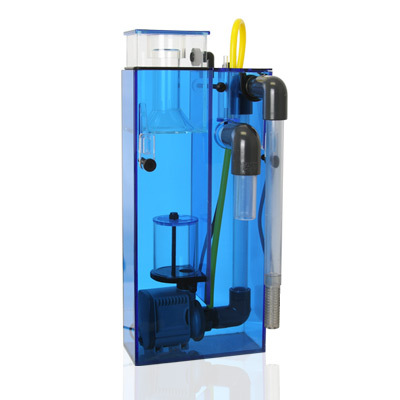 The AquaMaxx Hang on Back (HOB) Series protein skimmers are rated for tanks ranging between 50 and 100 gallons. The particular design, made of cell-cast acrylic, makes the skimmer makes it light enough to fit on nanos, and other smaller tanks. A neat feature about these skimmers, is that the cup is actually moved up and down to dictate the foam level and consistency of skimmate. Another feature, not often found on HOB skimmers is a drain fitting which will allow the hobbyist to use a separate reservoir for skimmate. The pump on the AquaMaxx HOB (Sicce or Sedra) is actually inside the body of the skimmer, which reduces noise, and saves space in your tank. AquaMaxx also states that this feature improves efficiency. The skimmers come with a built-in silencer which provides an almost silent operation.